New images of deep space are helping shed light on dark matter, the invisible material that accounts for more than 80 per cent of all the matter in the universe, but is little understood. The images are the first from an international project that seeks to aid understanding of how much dark matter is contained, and how it is distributed, in groups of galaxies – such as the group that houses the Milky Way. 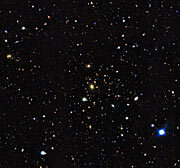 The study is also hoped to improve scientists' knowledge of how galaxies are formed. Being able to explain dark matter would represent a major scientific breakthrough. 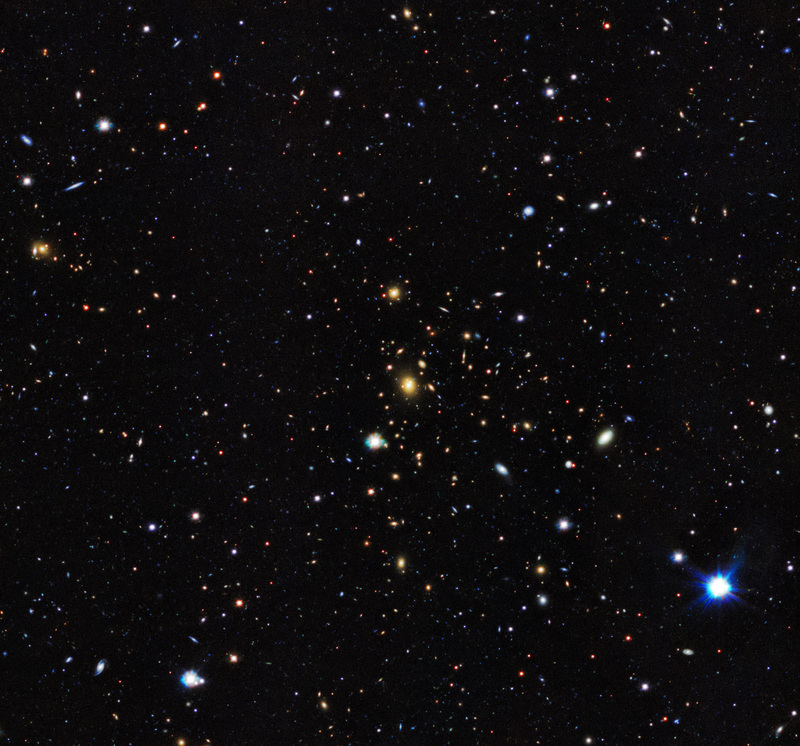 Researchers analysed images of more than two million galaxies, typically 5.5 billion light years away, and used their results to calculate precise measurements of the influence of dark matter. They examined how light emitted by galaxies is distorted by the pull of gravity as it passes massive clumps of dark matter. Researchers found that groups of galaxies typically contain 30 times more dark matter than the visible matter seen in stars. They also showed that the brightest galaxy in each group nearly always sits at the centre of the dark matter clump that surrounds it. This is the clearest demonstration to date of this phenomenon, predicted by theories of galaxy formation. Their research, known as the Kilo-Degree Survey (KiDS), uses images captured by the VLT Survey Telescope at the European Southern Observatory in Paranal, Chile. The study, led by Leiden University in the Netherlands, was carried out in collaboration with scientists from the Universities of Edinburgh and Oxford, University College London, Durham University, and from Italy, Germany, and Australia. It is published in The Monthly Notices Of The Royal Astronomical Society. Dr Catherine Heymans, of the University of Edinburgh's School of Physics and Astronomy, who co-leads the international team, said: "These early results in our quest to create a map of dark matter throughout the Universe are encouraging. We are on our way to a better understanding of the mysteries of this elusive substance, thanks to sophisticated telescope technology and the efforts of our international team of scientists." Dr Massimo Viola of Leiden Observatory in the Netherlands, who led the study, said: "We look forward to making many more discoveries about this most elusive of substances, dark matter, in the months ahead." Left, a group of galaxies mapped by KiDS. Right, the same area of sky, but with the invisible dark matter rendered in pink. Here seen is a group of galaxies mapped by KiDS. 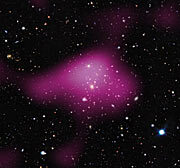 Here the invisible dark matter is seen rendered in pink on top of the visible-light image. 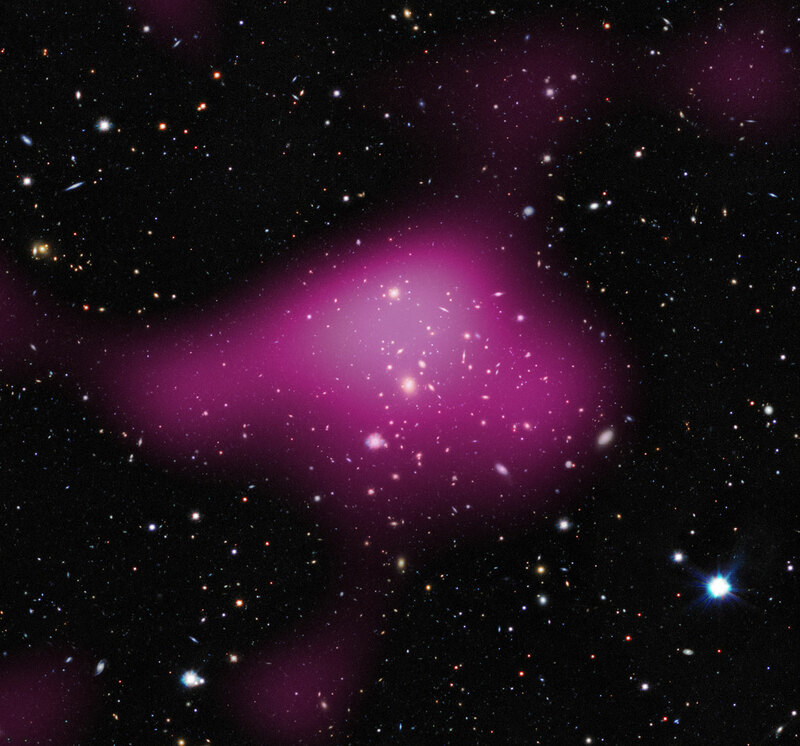 Animated gif of a group of galaxies, with and without the invisible dark matter rendered in pink.